2015 Challenge Information – Start R.I.G.H.T. The Start R.I.G.H.T. Challenge will be starting on March 14th, 2015! 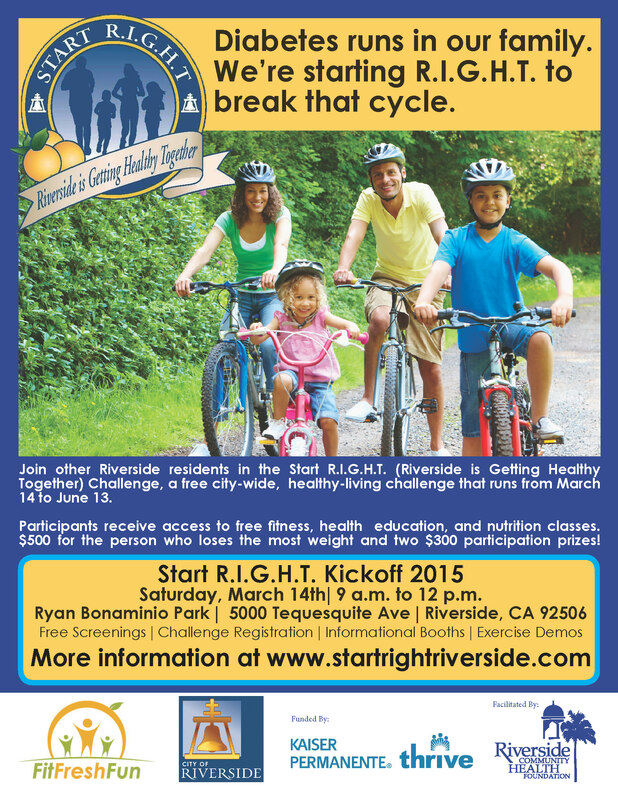 Join us for the kickoff event and Walk with the Mayor from 9am to 12pm at Ryan Bonaminio Park in Riverside. The Start R.I.G.H.T. Challenge is a city-wide, healthy-living campaign and challenge that aims to increase health knowledge and access to fitness and educational opportunities for Riverside Residents. The Challenge is completely FREE for people who live and work in Riverside to take part in! Residents who participate in the challenge have a chance to win a grand prize of $500. This year those that complete the challenge, by having both an entry weigh-in and exit weigh-out, are entered in a drawing to win $300. We will be giving away two $300 prizes. In addition, the neighborhood who logs the most activity in 2015 will be crowned “Riverside’s Fittest Neighborhood” by Mayor Rusty Bailey. Anyone who lives or works in the City of Riverside is eligible to enter the challenge. You will be asked to provide your address upon signing up for the Challenge through the MyPassport App. How can I sign up for the Challenge? Signing up for the challenge is easy! Just go to the MyPassport App and enter your information! If you would like to be eligible to win prizes, you will need to have an official weigh-in and weigh-out. Weigh-ins will be conducted starting on March 14 at the Start R.I.G.H.T. kickoff at Ryan Bonaminio Park in Riverside from 9 am to 12 pm. If you cannot make the event, please schedule a weigh-in on the week of March 16 to March 20 with Riverside Community Health Foundation by calling 951.788.3471! All participants must have an official weigh-in by March 20 at 5 pm to be eligible for cash prizes. Children, under the age of 18, do not need an official weigh-in to participate. We ask that they simply sign-up via the MyPassport App (after getting permission from their parents of course!) and sign-up. Super easy! Only adults, over the age of 18, are eligible to win cash prizes. The adult who loses the most weight, by percent of overall body weight, will win $500. Those adult participants who complete an official weigh-in and weigh-out from designated Start R.I.G.H.T. staff will also be entered in a drawing to win $300. Two $300 prizes will be given away. Weigh-ins will be conducted starting on March 14, 2015 at the Start R.I.G.H.T. 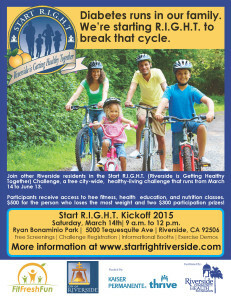 Challenge kickoff event at Ryan Bonaminio Park in Riverside from 9 am to 12 pm. If you are unable to make this event, please schedule a weigh-in with Riverside Community Health Foundation the following week ( March 16 to 20) by calling 951.788.3471. In addition, we will be awarding $500 to the school whose student’s log the most activity time during the Challenge. And, the Neighborhood that logs the most minutes of activity during the challenge will win the title of Riverside’s Fittest Neighborhood!